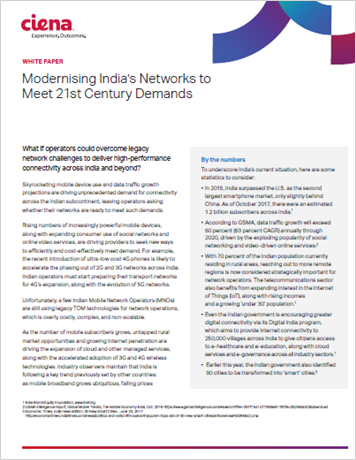 Skyrocketing mobile device use and data traffic growth projections are driving unprecedented demand for connectivity across the Indian subcontinent, leaving operators asking whether their networks are ready to meet such demands. The evolution to 5G will undoubtedly deliver significant capacity, availability, latency, and performance gains to those operators prepared to take advantage of it. As 4G networks expand and eventually evolve into 5G, Indian operators need to lay the groundwork now, to future-proof their networks.